Situated right in the heart of the city, Cardiff Castle is a unique complex of historical buildings incorporating a medieval castle, a Victorian Gothic mansion and a Norman keep, which in turn was built over a Roman fort. The city itself may have only been here for about a century, but Cardiff Castle stands as witness to more than 2,000 years of history. Roman soldiers and knights have lived in the castle, and the wealthy Bute family resided in it from early 19th century up until 1947. Those who visit Cardiff Castle will be rewarded with opulent rooms, Mediterranean gardens and Italian and Arabian décor. 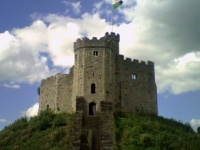 The Essential Ticket includes access to a selection of the lavish Castle Apartments, the Norman Keep, the Battlement Walk, the Wartime Shelters, the Cardiff Castle Museum of the Welsh Soldier, the Interpretation Centre (including a film show), and an audio guide in multiple languages. The Premium Ticket offers all this plus a 45-minute guided tour with an expert guide, and access to some additional rooms in the castle. People of all ages will enjoy exploring the castle complex, and at least a few hours can be happily filled doing so. Cardiff Castle is one of the top tourist attractions in Wales and definitely worth a visit for anybody in the city with an interest in history.